Although the Internet of Things is very much of the moment, sometimes all you need is a connected device. In this case, the device being connected is a set of kitchen scales. 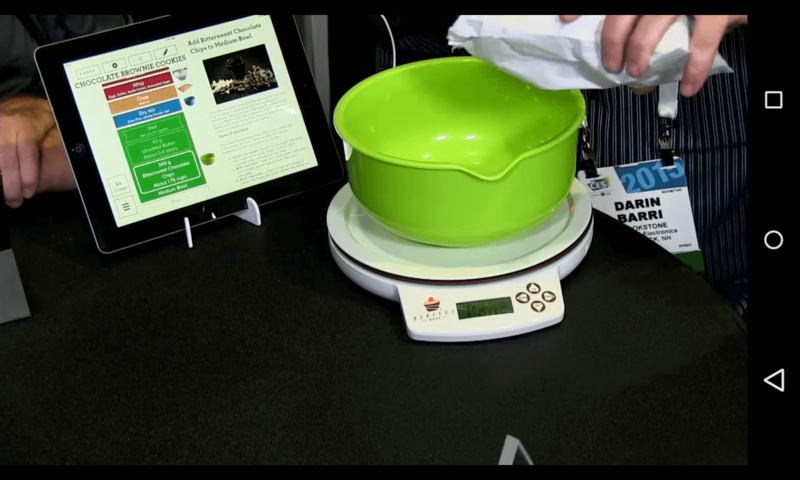 Todd and Todd start cooking with Darin Barri and Perfect Bake Scale and App. Targetted at cooks and bakers, Perfect Bake combines digital scales with a tablet app to make sure that the weight (or more correctly mass) is just right. Connected via the audio jack, scales can weigh in real-time, showing the quantity on the tablet screen. The app has hundreds of recipes and can walk the baker through the steps with mixing times and instructional videos. The scales come with colour-coded preparation bowls to help too and the app can adjust quantities to suit appetite. There’s an even an oven thermometer to make sure the temperature is right, so whatever’s baked, it’s baked perfectly every single time. The app available for both Android and Apple devices, the Perfect Bake Scale and App is available now for $69.99 from Brookstone. A Bluetooth wireless version will be available later in 2015.